Everyone wants to have the best gear, no matter what your sport is. In all cases, your performance in that sport is enhanced by having the best possible equipment. But where scuba diving stands out from most other sports in a big way is that having the best scuba gear might be the difference between life and death when things go unexpectedly. From the kelp forests to the coral reefs, the shipwrecks to the hidden caves and trenches, there is an abundance of life wherever you look. Even in the vast expanses of the ocean, schools of exotic fish and giant whales can be found, as well as the tiniest of sea life, such as krill and plankton. One thing most, if not all, divers agree on is that spending time under the ocean’s surface is the most serene, tranquil experience on earth. But there’s a good reason seamen and fishermen alike have been advising us not to turn our back on the ocean for too long. The sea can turn on you in the blink of an eye, with riptides and unexpected eddies, currents that are stronger than they seem, and even some of the most powerful predators in the world. While it doesn’t pay to be paranoid, it certainly does pay to remain aware. The most basic factor we as divers need to remember is that we are guests in the submarine world. Humans aren’t biologically engineered to remain underwater for long periods of time, as much as we love it. We lack flippers, which is why we use fins. Unlike some species of sharks, we don’t have a nictitating membrane that protects our eyes from abrasions and the salinity of the water, which is why we use scuba masks. Marine mammals such as whales, seals, and dolphins have a protective layer of fat to guard against the cold, but we lack that feature—hence wetsuits. And because we lack gills, we use diving tanks to breathe underwater. But tanks can only provide so much air for us, and ascending needs to be carefully accounted for. The deeper we dive, the higher the pressure levels—which means more of the nitrogen in our tanks is being dissolved in the water that makes up about 70% of our bodies. If you ascend too fast, the pressure being released has the same effect on that nitrogen as shaking the bottle before opening it does for soda. This is a very painful experience, and can even be fatal. Known as decompression sickness, or more commonly as the dreaded bends, it’s something no diver wants to experience. Those of us that have wouldn’t wish it on our worst enemies. To avoid the bends, you need to ascend at the right pace and take intermittent breaks (“decompression stops”) on the way up. You don’t want to be running out of air or time when you start ascending, otherwise, you’ll have to spend some time in a decompression chamber and hope for the best. But when you’re surrounded with and enthralled by the beauty of life underwater, it can be difficult to concentrate on calculating your depth, pressure, necessary ascension time, and how much air you have left. This is especially true when you’re a novice! Luckily, we don’t have to keep all of those calculations in our head—that’s what diving computers are for. But just as you don’t want to get the bends because of a miscalculation in your head, you don’t want to get them because your diving computer is faulty either. 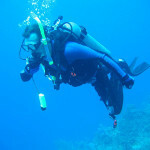 Diving computers, also known as personal decompression computers or decompression meters, are one of those cases where having the best gear isn’t just a luxury, but a must. We get it though—who wants to spend hours in front of the PC reading hundreds of reviews to find out which diving computer is the best? That’s why we’ve decided to help get you away from your screen and back into the water as fast as possible. To do so, we’ve done the research for you. Without any further ado, here are our top nine picks for the best scuba dive computers 2019 has to offer! Suunto makes a well-deserved appearance on our definitive list of the best scuba dive computers with their Eon Steel Wrist Computer, complete with Tank POD Transmitter. The much anticipated Eon boasts a bright display, easy-to-customize interface, and rechargeable battery. Designed by professional divers, it’s sure to deliver beyond your wildest expectations. With a focus on control and usability, Suunto has developed a diving computer that effectively evolves with you as your diving skills improve over time. You can switch between a classic and graphic interface according to your preference, and set-up addon-skins as you wish. View the data you want and need by customizing up to four display settings, and choose between a wrist strap or bungee strap. Boasting an impressive 10 gas mixture capability, 3D compass, alarm notification system, altitude adjustment, bottom timer mode, and air integration (with the Tank POD Transmitter), the Eon is sure to impress any professional diver. Download and update the software as new releases are launched, eliminating the need to upgrade periodically, and plan your dives with the Suunto Dm5 software. Even with thick diving gloves, the three-button interface is easy to use, and the Brightsee display allows you to read data outputs at any angle and lighting condition. The Eon also boasts the best depth rating, guaranteed to operate up to 492-feet (150 meters) in a temperature range of 32°F to 104°F (0°C to 40°C). Suunto’s new rechargeable battery will last between 20 to 40 hours on full charge and can be recharged using the Suunto charger or by connecting to a computer. The Suunto Eon Steel with Tank POD Transmitter is sincerely the most impressive dive computer available today. No matter what your needs or level of expertise as a diver, the Eon is sure to satisfy with its impressive depth rating, full customization, and rechargeable battery. Although an expensive option (starting at about $1,369), it’s an investment that can easily last a lifetime. Oceanic makes a second appearance to round-up our definitive review of the best scuba dive computers with the Pro Plus X. The manufacturers have re-invented the wheel with the new design, with a bright, low-energy consumption display featuring Thin-Film Transistor (TFT) technology. You’ll have little difficulty reading the data output in bright surface conditions, and can lower the intensity for viewing in low-light and night dives. The display is also larger, affording you an easy-to-read screen with intuitive color coding, the most legible digits available, and high-resolution bar graphs. With a four button system, you can easily set-up the Pro Plus X, and the patented Air Time Remaining and Dual Algorithm make for an impressive dive computer all-around. 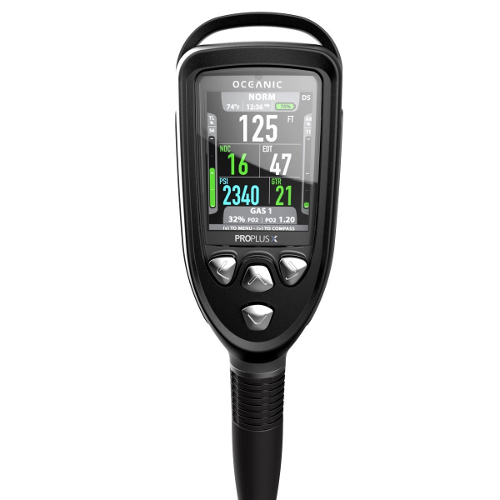 Receive accurate and reliable directional information with the digital compass, a quality standard that carries over to every aspect of the Pro Plus X’s diving data output. Combined with Bluetooth technology, a rechargeable lithium battery (boasting up to 60 hours of use), and a quick disconnect (QD) hose, the Pro Plus X is a firm favorite for many divers today. Audible and visual alarm notifications ensure you’ll never miss any important information, and with up to three nitrox mixtures ranging from 21% to 100% O2, the Pro Plus X is certainly designed to evolve with you. The operational depth range of up to 330-feet (100 meters) and temperature capabilities from 0°F to 99°F (-9°C to 60°C), you’ll be happy with the dive computer’s performance no matter the conditions of your dive. If you’re looking for innovation, the Oceanic Pro Plus X with Quick Disconnect Hose is the diving computer you’ve been looking for. The Thin-Film Transistor display, intuitive color coding, and high-resolution bar graphs make for an impressive solution, especially when considered alongside the low-energy consumption rate and rechargeable lithium battery life of up to 60 hours. No matter your needs as a diver, or the diving conditions you’re used to, this is a diving computer that promises to satisfy. Building onto the Perdix design featured above, the Shearwater Research Perdix AI with Transmitter boasts all of the same features. Notable differences include the AI technology, allowing for better automation of data readings, and an even lighter build than the traditional Perdix, with the AI version weighing in at only 4 oz. 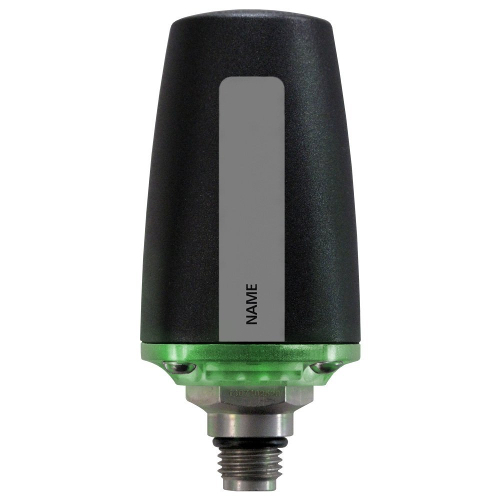 The addition of an optional air integration transmitter makes it an even more attractive option for those that can afford the $1,525 price tag (you can also mount up to two transmitters). The Shearwater Research Perdix AI with Transmitter builds onto the traditional Perdix by offering an improved automation of diving data thanks to the AI technology. A high-tech solution for technical and recreational divers alike. With a lightweight, contoured design, it sits comfortably on your wrist, and the high-resolution, full-color 2.2-inch display screen allows you to view all your important diving data with ease – without having to navigate between different screen modes. Despite being easily the most expensive option on our definitive list of the best scuba dive computers available in 2019, the Perdix remains a highly recommended option. TUSA make a well-earned appearance with their IQ1240 DC Solar Link Dive Computer. With the ability to transfer your diving logs to your smartphone or tablet with the Bluetooth Smart technology, and solar-powered recharging which eliminates the need to replace your battery, it’s an impressive solution for divers. Four gas mix support allows you to preset individual mixtures ranging from 21% to 100% O2, and the altitude smart mode means the IQ1204 will automatically adjust to your diving altitude. TUSA has also considerately included both visual and audible alarm notifications so that you never miss out on important data readings. These include your ascension rate, maximum depth, decompression limits, and decompression safety stops. Like many other TUSA models, the IQ1204 boasts a backlit display suitable for low-light diving conditions as well as night diving. You can also set the backlight duration as high as 10 seconds, which is activated by the touch of a button for quick and easy viewing. The optional deep stop feature for dives exceeding 80-feet depths (24.4 meters) runs of the Buhlmann ZHL-16C algorithm model. 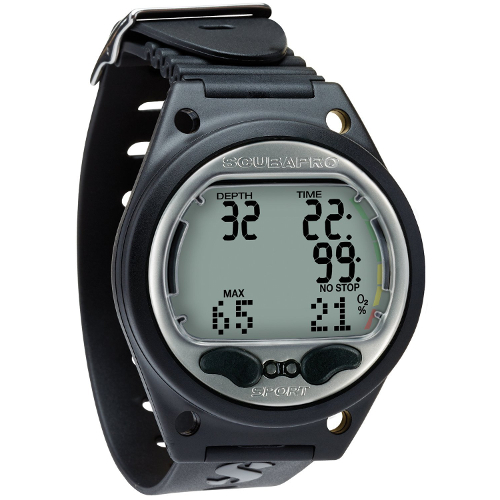 With a stopwatch, timer, alarm, and world time modes, and a depth rating of up to 330-feet (100 meters), you can be sure to enjoy a fully functional diving wrist computer that also boasts a 30-dive logging feature. The clock feature can also be set to either a 12- or 24-hour time format based on your preference, as well as both imperial and metric measurement units. With a digital compass mode that uses literal indications based on the 12 o’clock position, you can be sure to never get lost underwater. TUSA has included a comprehensive Owner’s Manual for ease of use. 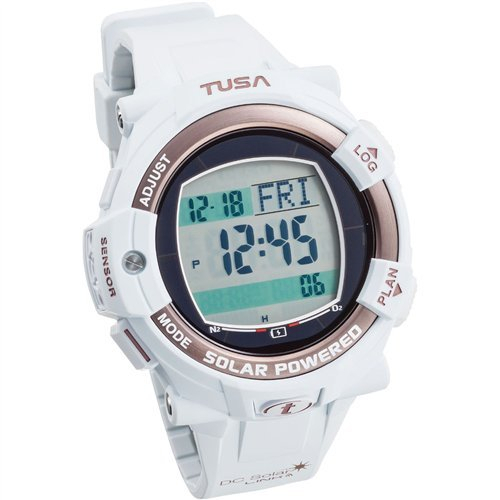 The next-generation offering from TUSA, the IQ1204 DC Solar Link dive computer eliminates the need for replacing your batteries by being fully solar power rechargeable. Transfer data from the 30-dive log to your smartphone or tablet using the Bluetooth Smart Technology, and switch between four different time mode settings as well as four gas mixture options. Never miss out on important data readings thanks to the visual and audible alarm notification settings, as well as the 10-second backlight feature. Shearwater Research is a Canadian dive computer company that made a name for themselves with their Predator model. The Perdix has put them firmly on the map in the scuba diving community, with a slimmer profile and lower weight (5.4 oz) than the Predator. Boasting a larger screen than most diving computers (2.2-inch widescreen), the Perdix (like the Predator and Petrel models before it) have set a standard for legibility, allowing users to view all the important data required without having to navigate through different screen modes. Shearwater originally catered exclusively for more technical divers, but have made accommodations for recreational divers as well with the Perdix. With a full-color display affording users an overview of all the relevant information, the Perdix also boasts an adaptive safety stop feature. Every dive is considered deco, with adjustments made for the number, depth, and time of decompression stops based on your dive time, depth, and diving history. The “Time to Surface” function keeps divers in the know with regards to their expected ascension time. The Perdix also features four mode settings, as follows. OC Recreational allows divers to use up to three gas mixtures, including surface air and nitrox. OC Technical allows for up to five trimix gases, and CC INT is best suited for closed-circuit rebreather diving. The final option is the standard Gauge mode, and all four can be easily customized in terms of data displaying. You can control all these settings with the use of the Perdix’s two-button system, featuring a single button on either side of the model. Being 30% smaller than the Petrel (which was already somewhat smaller than the clunky Predator design), the Perdix is also contoured to allow for an improved streamlined fit sitting closer and more comfortably on your wrist. Unlike other diving computers, the Shearwater Research Perdix operates on a set of AA batteries, and which typically last up to 30% longer than previous models. The large, bright color screen does still take a lot of power, however, and it’s highly advisable to purchase two sets of quality, rechargeable batteries to prevent a high running cost. 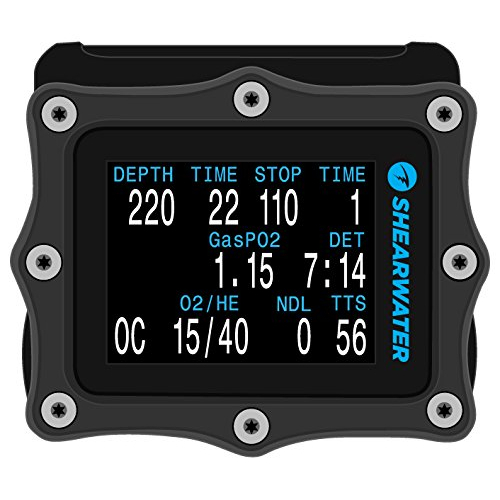 The Shearwater Research Perdix Dive Computer follows in the Predator and Petrel models’ footsteps in offering a high-tech solution for technical and recreational divers alike. With a lightweight, contoured design, it sits comfortably on your wrist, and the high-resolution, full-color 2.2-inch display screen allows you to view all your important diving data with ease—without having to navigate between different screen modes. Despite being one of the most expensive options on our definitive list of the best scuba dive computers available in 2019, the Perdix remains a highly recommended option. ScubaPro made a second appearance on our definitive review of the best scuba dive computers of 2019 with their Aladin H Matrix Guage, which also features a Quick Release (QR) hose. The model also falls under their Aladin range, which we introduced above with the SPORT Matrix Wrist Computer, and features many of the same functions. 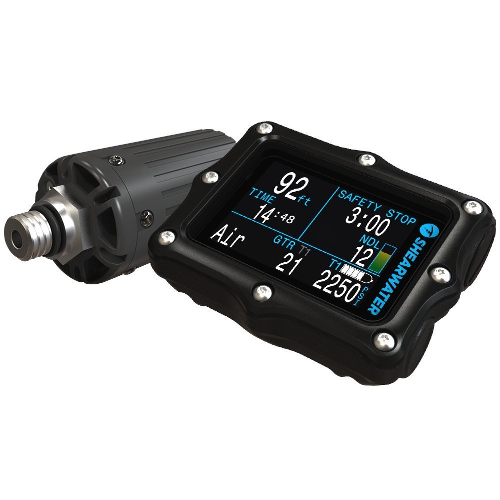 It’s a truly compact dive computer solution and boasts a highly intuitive data display system. With a metallic faceplate and segmented top and middle row display, as well as the matrix display on the bottom row (both of which are characteristic features of the ScubaPro Aladin Matrix range), it offers a sharp-looking, full-featured solution targeting at avid recreational divers. If you’re looking for a convenient dive computer with air integration, you need not look much further than this. The full air integration allows you to do away with the need for an additional submersible pressure gauge, and the inclusion of an onboard digital compass makes it a firm favorite among divers who prefer using a single dive computer rather than relying on several accessories and tools. Similar to the SPORT Matric Wrist Computer, the Aladin H Matrix features ScubaPro’s predictive multi-gas ZHL16 ADT MB algorithm, which also accommodates three gas settings ranging from 21% to 100% O2. Because the design is fully air-integrated, the system is also able to effectively calculate your estimated workload, as well as your remaining bottom time (RBT) based on your breathing rate. Another familiar feature is the Profile Dependent Intermediate Stops (PDIS) system, which takes your nitrogen loading, current and previous dives, and breathing gas mix into consideration for calculating your decompression stops for safe diving without the bends. Microbubble levels are also included, which again adjusts the algorithm’s conservatism based on your expertise, age, and physical condition. One major difference between the two models is that unlike the wristwatch version, the Aladin H Matrix Gauge only features two dive modes (Scuba and Gauge) as opposed to the SPORT Matrix’s three (additional mode being Freediving). To make up for this, ScubaPro has been sure to retain the altimeter, digital compass, active backlight, and option of salt or fresh water settings, as well as their visual and audible alarm notification system. The adjustable PPO2 (ranging from 14.5 to 23.2 psi, or between 1.0 and 1.6 bars) can similarly be switched off when not needed. ScubaPro’s bookmarking function also makes an appearance, as does the lens protection cap and two-year / 300 dives user replaceable CR2450 battery. As with the SPORT Matrix Wrist Computer, the Aladin H Matrix Gauge allows you to transfer your dive metrics to your iOS and Android smartphones with the Bluetooth 4.0 Low Energy function. For downloading this data to PCs and Macs that don’t include Bluetooth Low Energy technology, you have still buy a USB dongle (quick reminder: we recommend the Bluegiga BLED112). Unfortunately, the onboard memory capacity has not been specified by ScubaPro. The dive computer’s protector boot also covers the quick release (QR) hose fitting, which allows you to join and separate your high pressure (HP) hose between dives for easy data transfer, travel, and safe storage. A two button operation makes for easy, intuitive menu and settings navigation, and as always, ScubaPro has included a comprehensive Owner’s Manual. With packaging, the ScubaPro Aladin H Matrix Gauge weighs a hefty 52 oz despite its compact size. Boasting many of the same features found in their SPORT Matrix Wrist Dive Computer, the ScubaPro Aladin H Matrix Gauge offers a suitable alternative for divers looking for a functional tool with a quick release high-pressure hose fitting. Although some of the functions—such as the Freedive mode—have been removed, and the gauge packs a hefty weight at 52 oz. (including packaging), it’s an overall highly satisfactory dive computer for recreational divers who require a solution with full air-integration. ScubaPro lives up to their name, being another consistent, top-quality producer of scuba diving computers. Their Aladin Sport Matrix Wrist Computer shows us exactly how they’ve earned their prestigious reputation, as well as why they’ve maintained it through the years. The new design features a metallic silver faceplate with an easy-to-read display. Targeting divers who need multi-gas functions, the Aladin Sport Matrix also caters to recreational divers who would appreciate the incorporation of features that help them evolve in their sport. The easy-to-read display boasts of a segmented layout for the top and middle rows, as well as a matrix display on the bottom row that features an easy-to-use digital compass. Readability is improved with the active backlight, and you’ll never miss an important data reading thanks to the visual and audible alarm notification system. ScubaPro’s Aladin Sport Matrix makes use of the Predictive Multi-Gas ZHL16 ADT MB algorithm, which allows for three gases ranging from 21 to 100% O2 levels. Microbubble levels allow you to adjust the algorithm’s level of conservatism to match your level of expertise and experience, age, and physical condition. Profile Dependent Intermediate Stops (PDIS) calculate your recommended decompression stops based on nitrogen loading, your current and previous dives, and the gas mixture being used to promote a safer diving experience. You’ll benefit from the three diving modes available with the Aladin Sport Matrix Wrist Computer, namely Scuba, Freediving, and Gauge. All boast a maximum operating depth of 394 feet (120 meters) with a maximum environmental pressure reading of 189 psi (13 bars). The built-in altimeter lets you adjust the altitude settings up to 13,300 feet (4,000 meters). You can also set the PP02 from 14.5 to 23.2 psi (between 1.0 and 1.6 bars), or elect to switch the feature off entirely. The computer boasts a bookmark function and lens protector and allows you to download your dive metrics to your iOS and Android smartphones with the Bluetooth 4.0 Low Energy function. For transferring this data to PCs and Macs that don’t include Bluetooth Low Energy technology, you have the option of buying a USB dongle (we’ve tested a few and recommend the Bluegiga BLED112). The user replaceable CR250 battery included has been rated for two years of use, or about 300 dives, and helps the Aladin Sport Matrix display dive times of up to 199 minutes. Decompression calculation ranges from 3- to 394-feet (0.8 to 120 meters), and the wrist computer boasts an impressive operational temperature range of 14°F to 122°F (-10°C to about 50°C). As you can probably surmise from the previous sentence, the Aladin Sport Matrix allows users to switch between imperial and metric measurement units. Additionally, you can also choose between fresh and salt water usage. The quartz clock also provides divers with the time and date and rests comfortably on the wrist with a durable rubber band. ScubaPro has considerately included a full Owner’s Manual to help users get acquainted with their new diving computer. Whether you’re an experienced diver in need of a wrist computer capable of handling multi-gas features, or a novice looking for a solution that will help strengthen your performance and experience in the sport, the ScubaPro Aladin Sport Matrix Wrist Computer may be the one for you. With its easy-to-read segmented and matrix three-row display and active backlight, as well as the visual and audible alarm notifications, you’ll never miss out on important data. The impressive operational temperature and decompression calculation range, you’ll find it a versatile model suitable for almost all diving conditions up to a maximum depth of 394-feet (120 meters) and environmental pressure of up to 189 psi (13 bars). Never worry about your wrist computer dying on you at a critical moment thanks to the two-year / 300 dive user replaceable CR250 battery. Whether you prefer imperial or metric measurement readings, or frequent fresh or salt water diving spots, the ScubaPro Aladin Sport Matrix is a wrist computer that can accommodate your needs and adjust to your diving profile. Backup your diving logs on your smartphone with the Bluetooth 4.0 Low Energy technology, and transfer the data to your PC or Mac with the recommended Bluegiga BLED112 Bluetooth dongle. Oceanic is yet another scuba gear manufacturing company that features regularly and favorably in authoritative equipment reviews, including all of our definitive buyer’s guides. This time, it’s their GEO 2.0 Scuba Dive Computer Wrist Watch that puts them in the limelight. The GEO 2.0 feature’s Oceanic’s exclusive Buhlmann ZHL-16c based PZ+ or DSAT based Dual Algorithm. Additionally, the model also boasts a deep stop option, and the user interface has been redesigned to include a step back function that allows both forward and backward menu and settings navigation. A second Nitrox mix is also available, both being programmable up to 100%, as is an auto-update firmware solution that allows divers to download and install additional features for operational improvements via Oceanic’s PC Interface, which comes with an optional cable. You may also choose whether your first O2 mix is less or greater than your second gas mix, with no restriction. With regards to customization, the GEO 2.0 Dual Algorithm also allows you to program no-deco and deco profiles, making the wrist computer versatile enough to compete with virtually every competitive model available on the market. 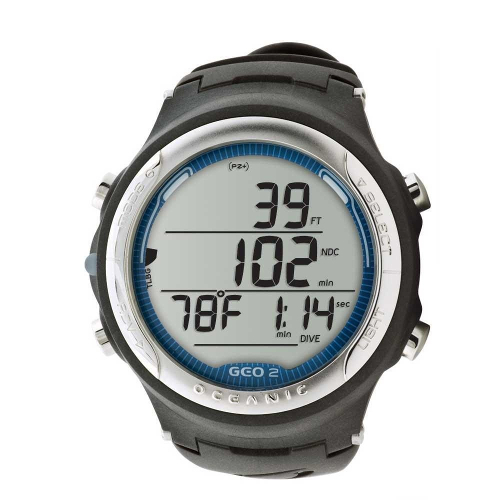 Putting the GEO 2.0 ahead of most competitors is the inclusion of four operating modes: Watch (which features alternate time, Chrono, a countdown timer, and daily alarm), Norm (for air and nitrox gas mixes), Gauge (including a run timer), and Free (which tracks all calculations, allowing you to switch between Norm and Free mode without losing any data). Decompression stop times are typically kept to less than three minutes, with minutes and seconds displayed. You may also choose to switch the deep stop countdown timer off if you so wish, or set it to a two-minute countdown at half of your maximum depth for dives greater than 80-feet (25 meters). Data is retained indefinitely, even when changing the battery, and a single-button features grants diver’s access to the max depth and bottom time data from your last dive. The logbook and history mode records up to 24 dives at a time (up to 99 in free dive mode) and displays information on your total number of dives and dive hours, maximum depth, and lowest temperature. Never miss out on important metrics with the audible alarm and flashing LED light notification system. The optional PC interface, with the exclusive OceanLog download and settings, upload feature, allows you to backup your logs indefinitely. To expand on the Buhlmann altitude algorithm information, the formula also includes IANDT and RDP (Cross) metrics, with an altitude correction factor and O2 limit measurement based on the NOAA tables. You’ll be able to adjust the altitude settings from 3,001- to 14,000-feet (between 916 and 4,200 meters), and enjoy a maximum operational depth of 330-feet (100 meters). The GEO 2.0 is also equipped with a backlight that boasts an adjustable duration feature for low light diving conditions and runs off a user-replaceable CR2430 lithium battery that lasts up to 300 hours. Oceanic have included a highly comprehensive Owner’s Manual and an impressive 60-month limited warranty. Boasting an impressive number of operational modes that set the GEO 2.0 ahead of most competitors, Oceanic has risen to the occasion with their latest wrist diving computer. While the maximum operational depth is lower than other models by 63 feet (20 meters), Oceanic have made up for it with superior data retention capabilities, which includes metrics before and after changing the CR2430 lithium battery (which lasts up to 300 hours). Navigating through the menu and settings is markedly intuitive thanks to the “step back” function, and Oceanic’s exclusive Buhlmann ZHL-16c based PZ+ or DSAT based Dual Algorithm with IANDT and RDP (Cross) metrics is sure to impress. Cressi constantly features on the most authoritative scuba gear reviews, and for good reason. The company has become well-known as an established manufacturer of top-quality diving equipment. Their Giotto range (which also includes the metric Giotto 3 Gauge Console) hold testament to Cressi’s hard-earned reputation. The Giotto Wrist Computer is Cressi’s first entirely independent mixed gas dive computer, and you’d be hard-pressed to find any complaints. With a three-button interface, the Giotto makes programming your air, nitrox, and gauge modes an effortless endeavor, from the first use to the 100th. Reading the computer’s data output is also made an act of ease thanks to the high-definition screen, which boasts large numerical displays without compromising on the computer’s compact and travel-friendly design. Battery life is prominently visible without taking up too much of the display surface. Critical information is accompanied by distinctly audible alarms, affording users peace of mind when under the water. And should you be sharing your dive computer with friends and family members who dive at different times, you’ll be glad to hear that you can reset the Giotto in full after each use. For this reason, it’s become a favorite for many rental departments. Which is also great news for anyone wanting to take the Cressi Giotto Wrist Computer for a test dive before committing to a purchase. Simply contact your local diving gear rental store and hire one for the day. We promise you won’t be disappointed, and will soon be buying one of your own! After all, the Giotto also features a new and improved Cressi algorithm. To develop this algorithm, Cressi collaborated with Dr. Bruce Wienke, himself a renowned diving professional and trusted expert. Basing the formula on the tried and trusted Haldane model, the new Cressi algorithm is fully integrated with Wienke’s Reduced Gradient Bubble Model (RGBM) algorithm factors. This provides safe decompression calculations, even with mixed gas tanks and repetitive multi-day dives. The Giotto software specializes in handling two different hyper-oxygenated diving gas mixtures and allows you to select your mix during the dive. As an advanced recreational tool, the Giotto Wrist Computer provides all the necessary information on your depth, dive times, decompression needs, ascension rate, and the surface intervals between dives. The advanced software continuously processes your nitrogen absorption and release and takes the capacity of inert gas enclosed in your mix into full consideration. 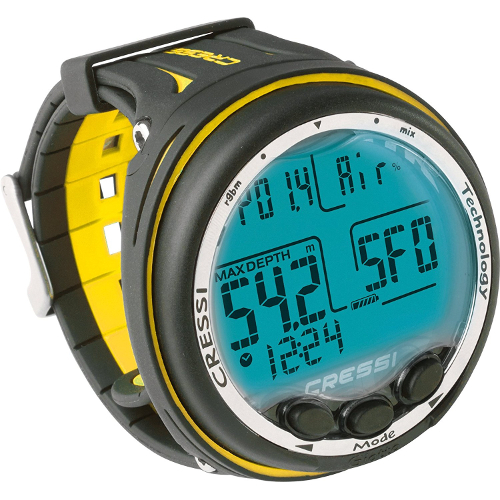 Cressi’s large Giotto display boasts their Priority Compartment Digit (PCD) display design, allowing for this impressive array of information to be shown in such a manner as promotes a direct, easy means of communication between you as a diver and your diving computer. Coupled with the audible alarm notifications system, this feature ensures that all data displayed at any given time as needed is clearly understood, and presented with perfect readability no matter what the visibility of your dive’s water conditions. In fact, the impressive backlight function makes for a clear display in low light and even night-diving conditions! Depending on your personal preference, the Cressi Giotto Wrist Computer allows you to choose between a 12- and 24-hour clock format. A full calendar is also provided, as is a versatile dive memory bank that allows you to record the metrics for 70 hours of diving, or about 60 dives. The Giotto’s mathematical model is able to perform both saturation and desaturation readings at any given moment of your dive, regardless of whether you’re using air or nitrox. In the case of the latter, you’ll be able to set all the related gas mixture parameters, such as the maximum PO2 value (between 17.4 and 23.2 psi, or 1.2 bars to 1.6 bars) and the mixture’s FO2 (oxygen percentage—typically between 21% and 99%). You’ll also have the freedom to set your preference between the metric or imperial systems (meters – C° and feet – F° respectively). Depth is displayed with pinpoint accuracy up to 393 feet (or 120 meters), and the algorithm allows you to adjust the altitude settings as necessary. With a 3-volt CR2430 battery (user- replaceable) and a gauge face guard, you can be sure the Cressi Giotto is made to last. Measuring 2.6-inches by 1-inch (depth by height – 65mm by 27mm) and weighing only 4.77 oz (135g), it makes for a truly lightweight and travel-friendly solution. For anyone feeling a little bewildered by the array of features and functions, rest assured that Cressi has included a comprehensive Owner’s Manual to help you get the most out of your Giotto Wrist Computer. It also comes with PC Download software to help you backup your logs beyond the already impressive internal memory. Cressi’s pioneering Mixed Gas Diving Computer design, complete with their own algorithm developed in collaboration with Dr. Bruce Wielke and incorporating his Haldane model RGBM formula, the Giotto Wrist Computer is an advanced recreational tool. Peace of mind is assured with the inclusion of a distinctly audible alarm notification system, bringing critical information on your depth, dive times, decompression, ascension rate, surface intervals, and nitrogen absorption and release. 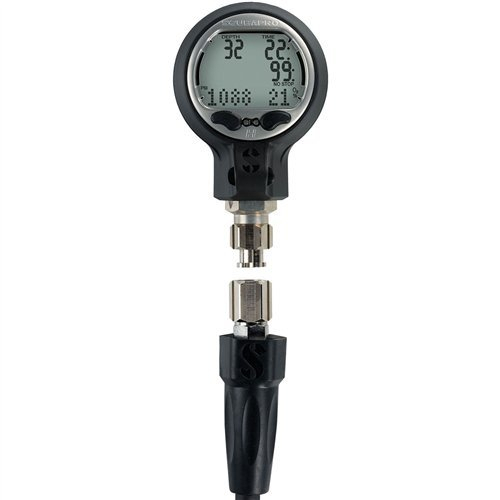 With a three-button interface, you can easily set your air, nitrox, and gauge modes. The impressive and versatile dive memory logbook allows you to retain information for up to 70 hours of diving, or about 60 dives, which can also be backed up onto your PC with the download software. 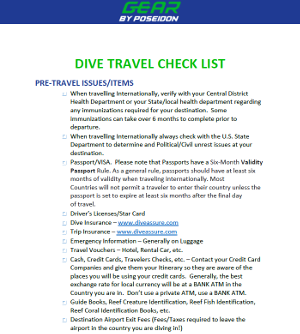 Should you wish to share your dive computer with friends and family who tend to dive when you don’t, the memory can be fully reset after each use, which also makes it a popular choice for rental departments. If having full control over how your diving computer displays information, then the Giotto is certainly for you, as you have the option of 12- and 24-hour clock time display formats, as well as being able to switch between imperial and metric measurements. With a user-replaceable battery and hardy gauge face guard, the Cressi Giotto Wrist Computer is built to last without compromising on a lightweight, travel-friendly compact design that only weighs 4.77 oz. If you’re worried that the vast array of features and functions can be overwhelming, Cressi has considerately included a comprehensive Owner’s Manual to help you get the most out of their innovative diving computer. A true testament to Cressi’s well-deserved reputation as one of the leading producers of scuba diving computers! As any professional and experienced recreational diver will tell you, having a quality scuba diving computer can be the difference between a comfortable, tranquil dive, or a potentially lethal case of the bends. We’ve scoured thousands of professional and community-based reviews to uncover the nine best models available in 2019. As an authoritative, definitive review, we guarantee that you’d be extremely hard-pressed to find anything better than the dive computers featured here! Remember to spend an adequate amount of time reading through your Owner’s Manual to ensure you have a full and competent understanding of your gear. After all, even the best gear is no better than the worst if you don’t know how to operate it.